This is the ultimate experience for the high intermediate to expert skier or snowboarder. A true once in a lifetime experience: Heli-skiing and Heli-boarding. The skiing and snowboarding takes place on alpine glaciers and open slopes, as well as in the trees and gladed areas of the subalpine forest with the backdrop of the fabulous mountain landscape. 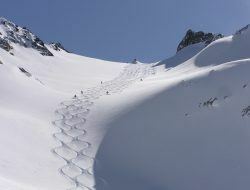 Spectacular scenery, pristine snow, diversified terrain. The heli-ski company we work with strives to meet guests' needs and provides the most exclusive, safest heli-skiing and heli-boarding experience possible. The heli-ski area lies a few minutes flight away and covers over 2000 square km - west of Golden and North of the Bugaboos - in the Purcell Mountains. These mountains of Interior British Columbia are famous for their reliable amounts of fresh snow and exceptional powder. There are more than 200 runs offering every conceivable type of mountain terrain and exposure. Multi-day tours and private group tours are available - please contact us direct for details. Do you want a break from skiing and snowboarding? Take a Helicopter Scenic Flight over the magnificent Canadian Rockies instead. Contact us about Heli-snowshoeing tours and Cross-country skiing by helicopter for alternate helicopter adventures out of Banff. Book a multi-day heli-ski or heli-board package through us for additional savings. Enjoy a Helicopter Adventure at your own pace, with your own private group. You will receive an exclusive helicopter service and a private guide.